SYNOPSIS: On the run from an army that destroyed their kingdom, the twin heirs to the Parros throne must avoid a magical land filled with incredible dangers. They are surrounded on all sides - by warring armies, an apelike tribe of desert creatures called the Sem, and the ruthless Langon clan. Giant sandworms, glowing, malevolent creatures, and powerful wizards mastering in the dark arts threaten them at every turn. If they were alone, they would surely perish. But in a dark forest, they are discovered by a mysterious stranger, a powerful warrior wearing a cursed leopard mask he cannot remove. His name... is Guin. 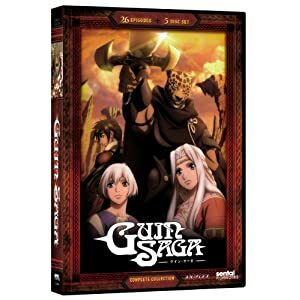 Guin becomes their protector and companion, though he remembers nothing of his life before meeting these young runaways. Together, they begin a treacherous quest to find safety for the royal twins - and the answers to Guin's secret origins. Special Features: The Men Who Searched For Their Own Star, Interviews with Kenyuu Horiuchi (Guin), Tsubasa Yonaga (Remus), Shintaro Asanuma Shintaro (Istavan) & Yuya Uchida (Norisse), Another Guin Saga: An Interview with Kiyoshi Imaoka (Guin Saga Novel Editor), Japanese Premier Event, Japanese Trailer Collection, Extended Trailer, Japanese Trailer, English Trailer, Clean Opening Animation, Clean Closing Animation. 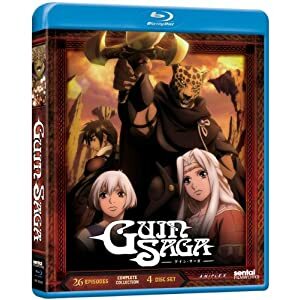 I'm looking at getting this during the section23 sale at Rightstuf but I heard that the dub was kind weird on this one. It starts off serious and fine but towards the end the writing becomes less serious then the original story. Can anyone confirm this?